For the Birthday-Cake-Always-From-Scratch Mom … an easel cake card. This one looks more complicated than it is. The trick is to score across the base of your card about 2 inches from the bottom, then fold under. You will attach your polka dot background and cake to this folded part so it can stand up when opened. The layers of the cake are just lengths of ribbon folded around chipboard. Toothpicks hold up the ric-rac “mom” banner. 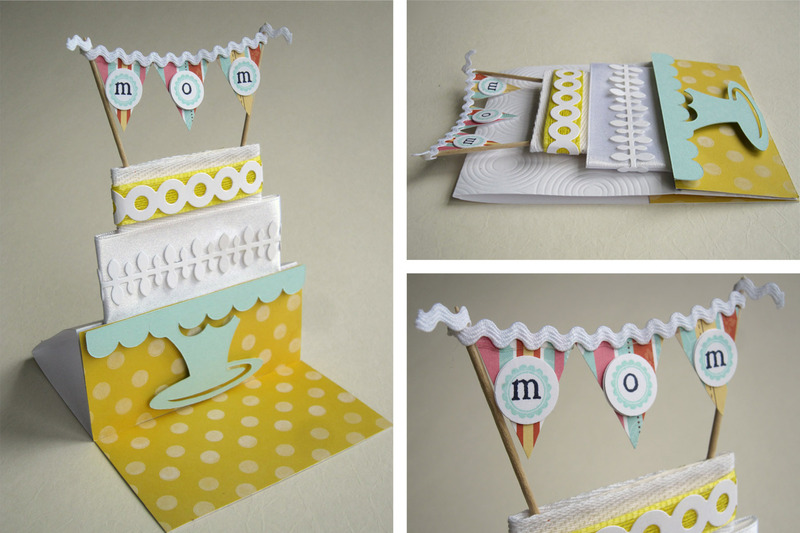 Attach your main part of the card (in this case the cake, strip of yellow polka dots, cake stand) to the 2″ flap, and there you have it. An easel card! If you want the easel to stand better, attach another piece of paper on the lower flap of the card so the easel has a little ridge to stop it from sliding flat. To see the inspiration behind this card, go here. 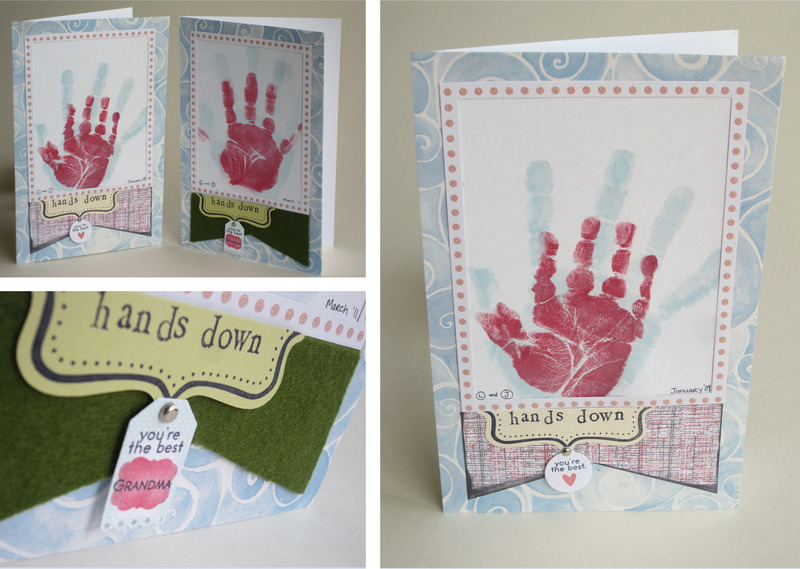 For the Sentimental Grandma … handprint cards. Have all your kids use a different color and let them have a blast covering their hands in ink. Make a tradition out of it so Grandma can track their growth. These two cards were done with my sons two years apart. For the Trendy Grandma … ombre cards. Jump on the hot, ombre trend of graduating color and have your kids cut varying lengths of colored paper. No measuring. Back the “o” with a circular design for an interesting focal point. If you like Inspired by Family articles and don’t want to miss a post in our beYOUtiful Mom Series you can simply click here to get our updates. Kelly Griglione~ I am a stay-at-home-mom with two boys, and desperately trying to cherish every minute of it. My goal is to simplify, but I usually fail miserably. One day life will be boring and then I’ll catch up on sleep! I blog over at Notable Nest. « Yes, That’s My Son! jessica thanks for stopping by. i think you could make them! give it a try! Hey! Visiting from Staci’s blog (Not Just a Housewife). These cards are so cute! 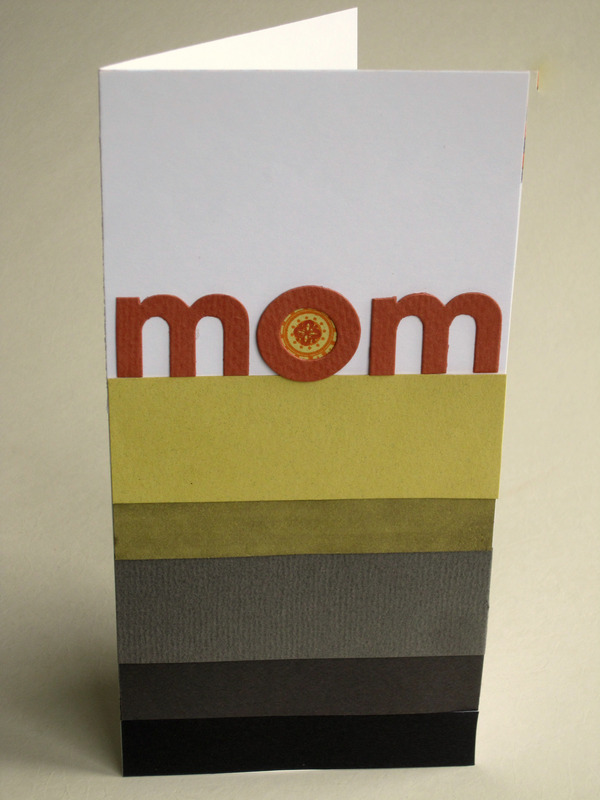 What mom wouldn’t LOVE these cards. 🙂 Thanks for sharing! Hi Gillian, Aren’t they cute, Kelly did a great job. The easel card looks awesome and complicated to make, but it is totally impressive! Michelle, I am going to give it a try and I am not a card person. Oh my goodness this is awesome! You are so crafty! 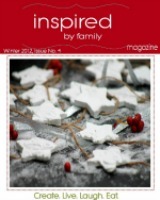 We would LOVE for you to stop over and link these up in our Crafty Saturday Showcase. It is just our 2nd week. 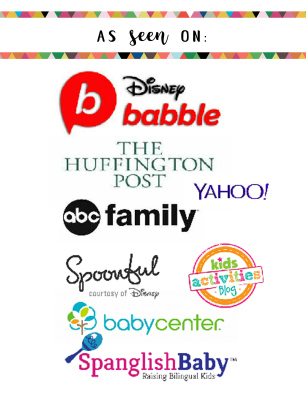 Your blog is cute and we can’t wait to look around some more! I love the name of your blog!